Our Family Tree Throw Pillow are ideal for celebrating love and loved ones! Newlyweds or families can create an heirloom for future generations. 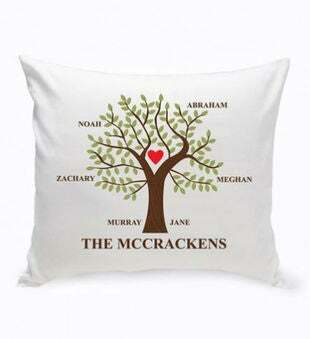 Printed in our white 16x16 throw pillow, each pillow includes a tree design with room for up to 8 names and a surname. A great gift for proud parents or grandparents. Personalize with family's last name up to 20 characters ("The" is standard) and up to eight family members first names up to 10 characters per name. NOTE: Names are listed bottom to top, example: Name 1 will be at the bottom left of the tree trunk, Name 2 bottom right of trunk, Names 3-8 will be dispersed upwards.